The Boy Scouts of America are scheduled to make a decision this week on their membership policy. This could prove to be a significant shift in policy that has the potential to impact the future of scouting. In place of their national policy prohibiting the membership of homosexuals, the BSA may implement a localized policy where “the chartered organizations that oversee and deliver Scouting would accept membership and select leaders consistent with each organization’s mission, principles, or religious beliefs. BSA members and parents would be able to choose a local unit that best meets the needs of their families.” In essence, each local organization that sponsors a Boy Scout troop would have the ability to set its own policy regarding sexual orientation. The merits (or demerits) of this potential policy shift have been discussed in the media and will continue to be the subject of evaluation in the days to come. However, I want to ask the question: Does this potential policy change by the Boy Scouts represent the face of the “New America”? What is the New America? The proposed policy of the Boy Scouts gives us a guide for what the New America looks like. First, in the New America convictional beliefs are discarded for the sake of avoiding cultural pressure. 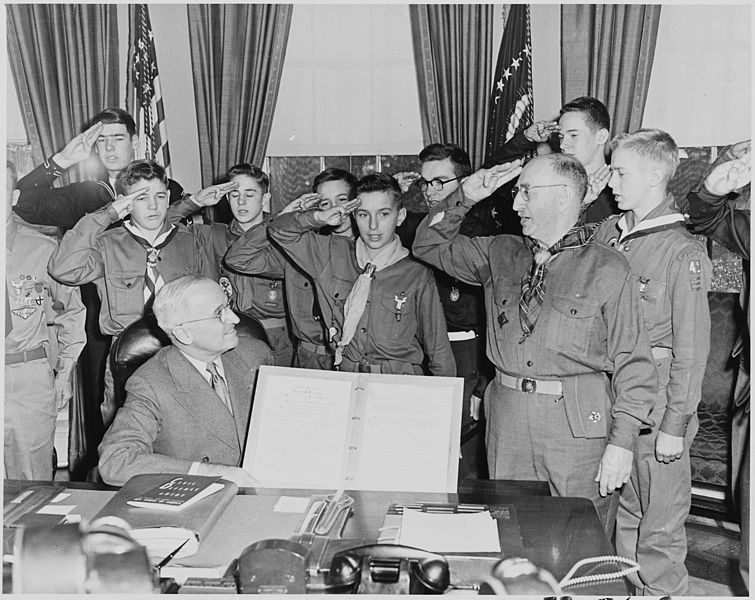 There is no doubt that the Boy Scouts have faced extreme pressure from the homosexual community to change their policy. Even after a decision from the Supreme Court in 2000 that allowed the Boy Scouts to maintain their membership policy, the pressure has grown. At this point, however, at least some of the pressure has been building from the executive board where two prominent members have expressed publicly that they would work towards ending the policy. Unfortunately, discarding convictional beliefs for the sake of avoiding cultural pressure is a hopeless cause. For the Boy Scouts, many of their sponsoring organizations (churches, schools, and civic groups) will now face pressure to include homosexual scouts and leaders in direct opposition to their own beliefs. Unlike the national organization with the time, resources, and money to fight the challenges, these local groups will either capitulate to the pressure or drop their sponsorship. Effectively, the national organization will suffer because they are unwilling to stand up in the face of pressure. Second, in the New America decision-makers refuse to take responsibility for those under their authority. President Harry S. Truman famously had a sign on his desk in the White House which read, “The buck stops here!” Implied in that phrase were the ideas that tough decisions were made here and the blame for those decisions could not be passed along to someone else. It appears that the Boy Scouts have chosen to pass the buck with their new proposed policy. Rather than taking responsibility for the hard decision (either keeping the policy in place or directing the sponsoring organizations to abide by a new policy), the national organization has passed responsibility down the line. This is not the natural line of progression for responsibility. Responsibility increases as one moves up the chain of command. There is no doubt that a scoutmaster would take responsibility for his troop rather than allowing the scouts to do what is right in their own eyes. This failure to take responsibility is nothing new to the human race. When asked by God if he had eaten fruit from the tree about which God had commanded him not to eat, Adam replied, “The woman who You gave to be with me, she gave me from the tree, and I ate” (Genesis 3:12). Adam failed to take responsibility and blamed Eve, yet he still suffered the consequences of his sin. In the same way, the national BSA may feel that they can dodge the consequences of making a decision by placing the burden upon the local organizations; however, their day will come, either through a plethora of lawsuits or an exodus of sponsoring organizations. Finally, in the New America disagreement equals hatred and bigotry. On controversial issues, such as homosexuality, disagreement is often equated with intolerance and labeled as hate speech, bigotry, or a danger to society. For example, Richard Ferraro, vice president for communications for the Gay and Lesbian Alliance Against Defamation (GLAAD), granted an interview to the New York Times. In part his statement read, “Prohibiting or ejecting gay children or leaders sends a dangerous message to all children, Mr. Ferraro said, adding, ‘It’s policies like this that contribute to bullying in schools.’” The appeal here is not to logic and reason (or even the legal right that BSA has to exclude certain people). Instead, Ferraro has equated the membership policy to bullying. His analogy is replete with fear, danger, and hatred. The days of civil public discourse appear to be fleeting. Respectful disagreement is no longer tolerated. The Boy Scouts had previously staked their claim on this issue in a respectful, yet clear, manner. However, that policy has fallen out of fashion in American culture. In the face of accusations of being bullies, bigoted, and out-of-touch, the BSA is on the verge of yielding to the loudest voices in our culture. They do not seem to be up to the task of making their case in a reasoned, balanced argument. We will find out later this week what the Boy Scouts decide. It seems evident that the policy will be changed. Time will tell if the Boy Scouts of America will survive this monumental shift. Deron Smith, “Media Statement,” Boy Scouts of America, January 28, 2013. Erik Eckholm, “Boy Scouts to Continue Excluding Gay People,” The New York Times, July 17, 2012.